Gear4, a re-branded name from Disruptive Limited in 2006, is a UK-based company known for its docking audio and MP3 accessories. This 2012, Gear4 has tasked Iontech, Inc. to be the distributor of their speaker systems here in the Philippines. Not only do they specialize in iPod docking speakers, but wireless Bluetooth speakers as well. Starting off with the most affordable speaker called StreetParty Size 0, music enthusiasts will love it for its 16 mm-only thickness and under ¾ lbs weight. This ultra slim and ultra portable speaker dock only costs Php3,690. The AlarmDock Halo 2 at Php4,490 is the best friend of sleepy heads. It has a sleek design, featuring rich and great sounding dock that will complement any bedside table. Features include full alarm clock functionality, FM radio with preset saving, animated weather display on dimmable LCD, and long and short range wireless remote control. On the contrary, those who love throwing parties whether at the living room or at the beach will like the HouseParty Portable Wireless. It's a great tool for dancing the night away with awesome music. Known to hold out 16 hours of uninterrupted sound, purchasing it at Php6,690 ain't bad. Talking about the man of the hour, Gear4's flagship model is the AirZone Series 1 selling at Php11,590. Its high performance stereo speaker enclosed in a high gloss metal finish brings outstanding sound and unbeatable value. It is indeed beautifully designed to complement any room. Not to forget the kids and young-at-heart, Gear4 is also offering officially licensed Angry Birds speakers in big and small sizes. With the big ones ranging from Php3,390 to Php4,990 and small sized speakers at Php1,390, these speaker docks do pack a punch. 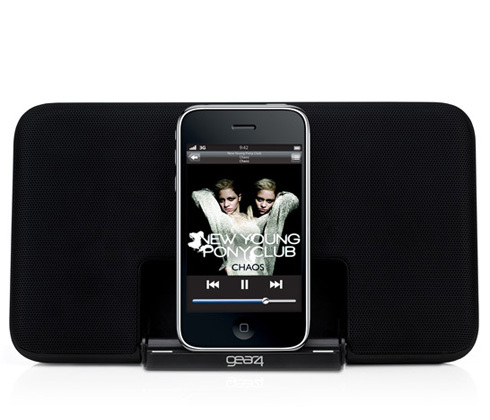 It features 30w amplifier, dedicated sub-woofer and bass control, iPod/iPhone compatible dock, and comes with a remote control. Among all the speakers that I've mentioned, one of them truly stood out. The Renew SleepClock is probably the most innovative alarm clock dock in the market today. With the help of the Gear4 Renew SleepClock app, it is able to monitor our sleep and wake up cycle. It senses our breathing pattern, lowers down the volume when it know we're already asleep, and wakes us up at the lightest moment of our sleep. At an SRP of Php10,190, this alarm clock aims to help everyone sleep better. Gear4 speaker docks and accessories are available at major consumer electronics and IT retailers nationwide. Check out the other cool items at www.Gear4.com and like their Facebook page.